Specology: POP QUIZ: WHAT'S A FOUCAULT PENDULUM? The reason I ask about Foucault pendulums is that I saw one last night here in Rockford at a USGBC tour of Rock Valley College's new LEED (soon to be) Gold Jacobs Center for Science and Math, designed by Rockford architects Saavedra Gelhausen. 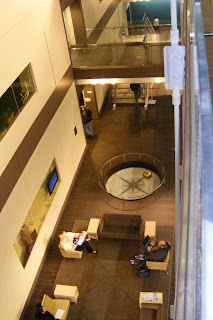 The pendulum is the focal point in the building's three-story entrance/atrium. 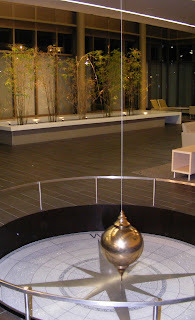 I won't even attempt to explain what a Foucault pendulum is, because Wikipedia does such a good job here. For more detail on the Jacobs Center, Rock Valley College's extensive sustainability efforts, and the design and construction team, click here. This new building is a great place to be, as well as a great place to learn. 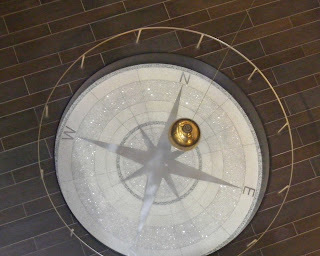 Here's what the pendulum looks like.